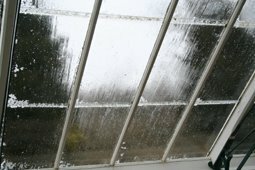 Very wet, very cold and very windy weather last week = Very tidy greenhouse. Also, no more mealy bug on our citrus trees. 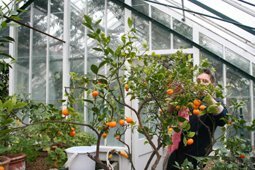 Tony spent a morning wiping the leaves our oranges and lemons free of mealy bugs, in the warmth of the greenhouse . These little creatures look nothing more than a tiny speck of cotton wool stuck to the branches or leaves of the oranges, and colonies will increase if not treated. 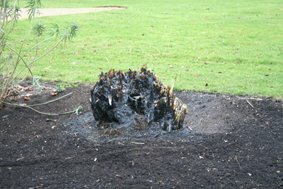 Low numbers will not really cause any harm to plants, but severe infestations can lead to eventual death of the plant. Because of the waxy 'cotton wool' covering these pests have, pesticides have a limited effect, so physically removing them with a little soapy water is far more effective. And at least you escape the worst of the wet, cold and wind. 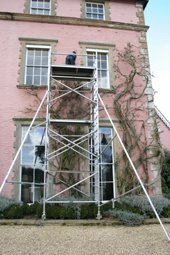 Every February and July we prune the very large wisteria which covers the front of the Manor. 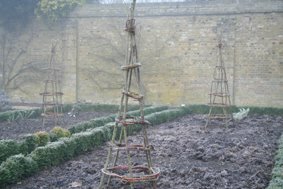 This time of year it gets a hard prune, back to just 2 or 3 buds from the main framework. At this time of year the buds have started swelling, so they are easy to spot where to cut back to. Any long, whippy growth is also cut back, which may have been missed in the summer prune. The reason why we give it another prune in July is to shorten the whippy growths to about 30cm from the framework to allow more light to the wood, helping the flower buds gather energy for next years show - and what a show! 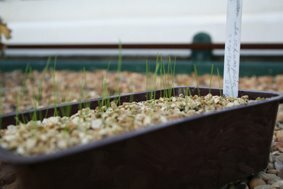 A couple of weeks ago, the seed of Deschampsia cespitosa was sown in the propagator. The seed was part of the annual order we send to the RHS seed list scheme. Available to all RHS members, the scheme gives access to unusual seeds collected in the RHS gardens around the UK. For just £10 you receive 20 packets of seed you choose from their comprehensive list, and these are sent out in spring. 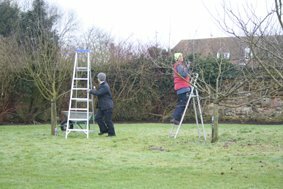 The annual task of pruning our apple tress in the wild flower meadow has come around again, and it was a case of girl power for the job - three of us all atop the step ladders snipping away. All our apples were planted in the same year, and they all old varieties with some lovely names like 'Peasgood Nonsuch' and 'Irish Peach'. They were bought from Bernwode nursery near Aylesbury about 1998 (I shall have to check the diary). Reduce last years growth (identified by the shiny new wood instead of older grey wood) by at least half, preferably two thirds. Cut to an outward facing bud. Most of our trees are spur bearing, (the apples grow on 'spurs' along the branches), but some are tip bearing. We treat them pretty much the same, but they are pruned less hard. 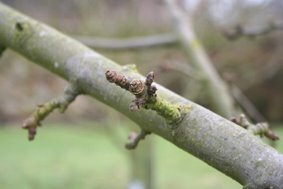 The fruit buds (pictured) are quite clear this time of year, they are much fatter than the leaf buds. You can see the spurs quite clearly too, definitely do not remove these or you won't have any apples this summer! Every two or three years we set fire to our two pampas grasses in the old herbaceous border, and the weather was perfect for this job on friday - very dry for the last couple of weeks, a gentle breeze, and before the grass has started to grow again. It has a certain amount of naughtiness this job, like you are not really supposed to be setting plants in the borders alight, but if you have ever tried to tackle a large pampas with loppers and shear, believe me it is a lot quicker and easier and you end up with less cuts to your arms! 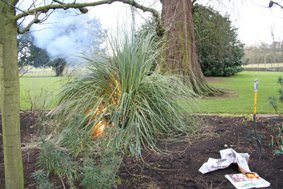 I know there is an opinion that setting pampas grasses alight may damage the crown of the plant, yet in the 12 years we have been practicing this, they have not suffered. The 'after' photo shows the result, but it will look fine as soon as it starts growing in spring. Remember to check for hedgehogs before you start though! 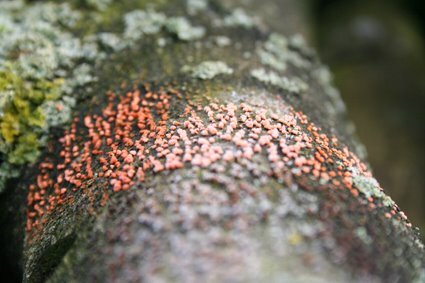 While pruning the roses this week, we noticed some tiny red 'pimples' on some of the dead wood we were pruning out. This is coral spot, a fungus which mainly attacks dead parts of woody plants, but may spread to live wood if not pruned out. The correct name is Nectria cinnabarina. This lovely name observes the fact that the final colour of the mature pustules (not such a nice word) is cinnibar red. I often see it, not just on dead wood, but old twiggy plant supports, the trellis obilisks our roses are grown against and wooden fences. So whenever it is spotted, we prune the branch, to prevent it spreading - and the chances are the branch is already dead. No frost in the greenhouse! This week has seen a lot of cold frosty weather. As it has been so dry, from inside it hasn't looked particually cold, as the grass has not been white and crisp, but on Friday the thermometer didn't rise above 0 degrees C at all. 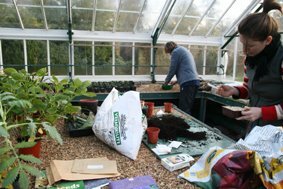 This is always a good time to go into the greenhouse and sow seeds. We had grasses and perennials from the RHS seed distribution scheme, which were sowed in potting compost and covered with perlite. These were watered and placed in the two covered propagating units at either 15 or 20 degrees C depending on the seeds germination requirements. Seeds can be fickle things, and some will germinate within a few days, while others may take up to 6 weeks. Just before christmas, Rachel and I had sowed seeds which needed stratification (a period of cold to break dormancy), so after sowing we placed them in our coldframes outside to expose them to the cold, of which we have had plenty of nights below freezing. This has already triggered germination in Nepeta parnassica, Sedum aizoon and Hyssopus officinalis. So don't assume every seed needs heat to germinate!